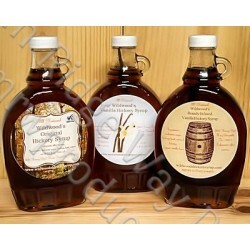 Enjoy one each of the Falling Bark Farm's all natural Hickory Syrup made in small batches. On Pancakes or waffles for breakfast; but also great as a grilling or finishing glaze on pork, chicken or duck; use in salad dressings, whip cream, cake frosting; drizzle over butternut squash or use as a finish to a baked sweet potato. Don't forget ice cream, what a treat! For you adults try it with a some rum, bourbon or brandy. The uses are limitless.